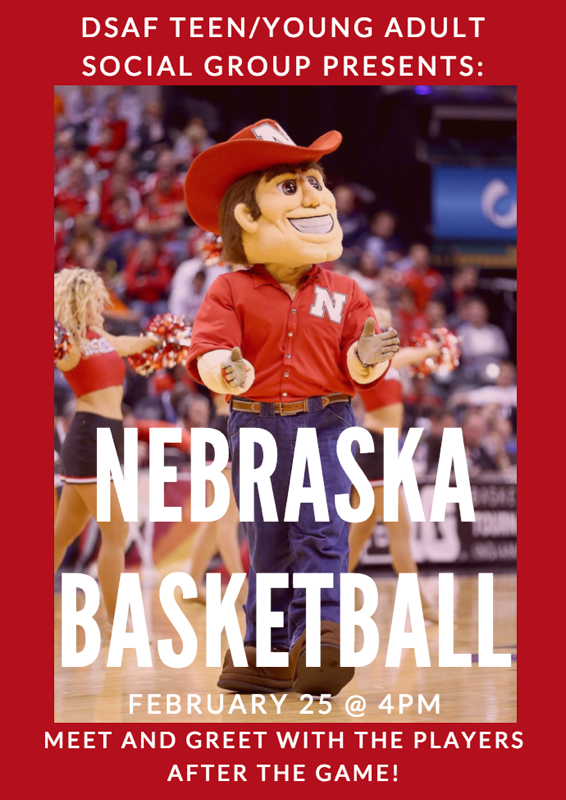 Ticket to UNL Men's Basketball game (Penn State vs. Huskers) and meet the players! *Eligibility limited to DSAF teen/young adult members with Down syndrome. Catch the UNL Men's Basketball game, then MEET the players! Tip off - 4 p.m.
Limited tickets available - register to reserve yours now! Please note: eligibility is limited to DSAF teen/young adult members with Down syndrome. DSAF pre-purchased a block of seats for the Feb. 25, 2018 UNL Men's Basketball game. Tickets will be presented to the registrants at a designated meeting place/time, just prior to the game on 02-25-18. One volunteer will attend with every two DSAF members. Members and volunteers will enter the arena together and sit as a group during the game. Afterward, the group will MEET THE PLAYERS! Full details will be communicated to registrants prior to the event (i.e. drop off/pick up times and location).